Becoming S2F in a very important year. We went in to 2017 as Start 2 Finish Marketing, but left it as S2F. Ok, we’re still Start 2 Finish marketing and lots of people already know us as S2F but we’ve taken a considered approach to the rebrand with this subtle redirection. The most notable occurrence being in the redesign of our logo. In 2018 you’ll be looking at an even slicker outfit with a greater stake in Birmingham marketing. Last year was a very important one for us, and we’re proud to say the brand is stronger than ever. Start 2 Finish Marketing does what it says on the tin. Providing a complete marketing service for your business, from start to finish. 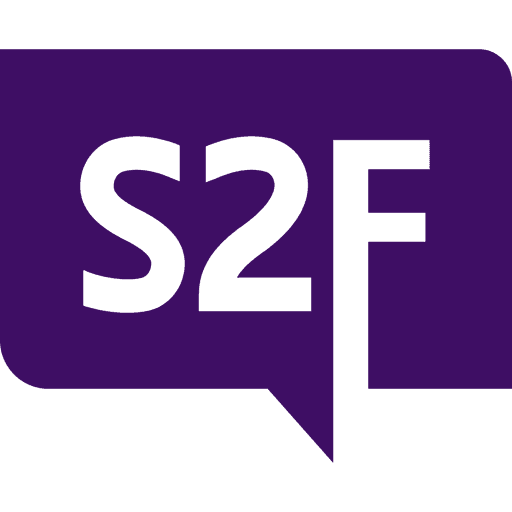 It helped attract some of our favourite clients, and it will be an ever-important part of the S2F offer. But in our pursuit of greater simplicity, the abbreviation is the perfect representation of our new brand. Slick, punchy, minimalistic. It provides us with a memorable stamp that’s going to carry us into the future with optimism. With the new brand and success, we thought it fitting to improve the space we work in too. We’d been in the same office for over ten years, and while cosy, the setup didn’t suit the way we like to work. Our search for new premises led us just four floors down in the same building. But don’t mistake the short move for a lack of ambition. It’s a big, beautiful open plan with purple branding on the walls and quirky yellow armchairs facing the door. A fantastic new space with less barriers and more communication. More idea bouncing; more coffee flowing. Now we’ll spend less time navigating offices and more time doing the work we love. Making a real difference to our clients. For S2F, and for everyone that works with us, this year is going to be a very good year. For regular news updates and interesting marketing and design discussion, follow our Twitter account.